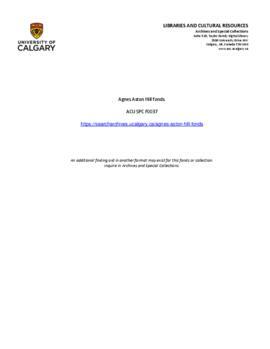 Fonds consists of manuscripts of poetry, articles, short stories and talks; scrapbooks containing newsclippings of articles about and poetry by Calgary authors and others; published work; and miscellaneous material. Fonds consists of correspondence; manuscripts of poetry, short stories, addresses, articles, essays, reviews; university and teaching related material; works on C. Wiseman; photographs; and published works. Fonds consists of the following series: correspondence; poetry; fiction; drama; prose; published work; works on Earle Birney; audio-visual; miscellaneous; and works by other authors. Fonds consists of letter, notes and manuscripts of poems. Grace Le Roy Aitkens fonds. Fonds consists of newsclippings and four loose leaf binderscontaining poetry manuscripts and clippings of published poems. Most clippings do not identify source and are undated.